After a long hiatus, the Appliance Nerd is back! 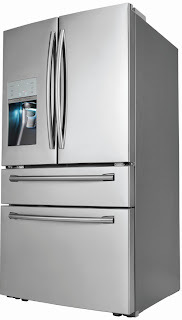 Today we're looking at the Samsung RF31FMESBSR French door refrigerator. It is available in stainless steel. As is standard with Samsung French door refrigerators, the RF31FMESBSR has dual evaporators, which separates the air in the refrigerator from the air in the freezer. No garlic/onion ice cream for you! The Samsung RF31FMESBSR boasts a large 31 cubic foot capacity, with plenty of refrigerator cabin space for all your fresh foods. In addition, it's a "counter height" model, meaning it has an externally accessible pantry drawer whose upper edge lines up with the bottom edge of the countertop for a more seamless look in your kitchen. As with all Samsung French door refrigerators, all horizontal handles (pantry and freezer) are hinged at the door so pegs will push the door open as you pull, releasing the seal from the body of the refrigerator. The freezer is copious, with a full 9 cubic feet of capacity. That's plenty of room for a turkey, a ham, frozen hamburgers, TV dinners, ice cream, and whatever else you're planning to cram in there. The refrigerator cabin houses the icemaker, which dispenses through the left door, as is standard in most French door refrigerators. Consistent with all Samsung French door refrigerators, the icemaker is inside the cabin rather than mounted on the door. There is a flip-shelf attached to the side of the icemaker for enhanced loading flexibility. It also has water dispensing on the door. And, the dispenser area is lit by an LED which can be turned on or off as you like. But, what sets this model apart from the rest of the pack is that it incorporates a SodaStream carbonation cartridge in the door. That means you can dispense filtered, CARBONATED water! Make your own soda with a dash of soda syrup and cold, clean, bubbly water straight from the fridge. No more bottles! No more cans! No more mess! Save money on soft drinks. Have energy drinks whenever you want. Diet soda on demand. And, you can send the cartridges back to SodaStream to exchange for refilled cartridges. Super easy. If you want huge capacity, you like French door design, and your household enjoys having soft drinks, the Samsung RF31FMESBSR is an excellent refrigerator to consider.